When it comes to energy, the Toy Manchester Terrier is full of it. It is very playful and loves attention. However, attention from strangers is not preferred. It is often awkward, reserved, and timid when approached by someone unfamiliar. This also goes for other pets as well; if it does not know the other animals, it will seclude itself. The Toy Manchester Terrier is a scrappy dog when it comes to hunting. Its instincts are strong and it is very talented in the chase and capture. It loves to play games like fetch, that involve some type of hunting and retrieving. Toy Manchester Terriers will not survive long if forced to live in the great outdoors. It is definitely an indoor pet. It does, however, love to spend time outdoors, running in yard and chasing small game, but only when the weather permits. Toy Manchester Terriers do not prefer cold weather or rainy, wet, dreary weather. If the sun is shining, it will be content spending time outdoors. This breed even is privy to a soft, warm bed. These diva-like characteristics are suggested for someone who has the time to tend to them. If your considering buying a dog and spoiling it with all things nice, then the Toy Manchester Terrier would be a wonderful option. As for this breed’s coat, is has a very short, think coat that is next to impossible to tangle due to its miniscule length. It does require occasional brushing though, to ensure dead hair and/or any germs or bacteria is removed from its coat. Major health concerns don’t typically target the Toy Manchester Terrier. This breed falls susceptible to more minor concerns, such as vWD and cardiomyopathy. 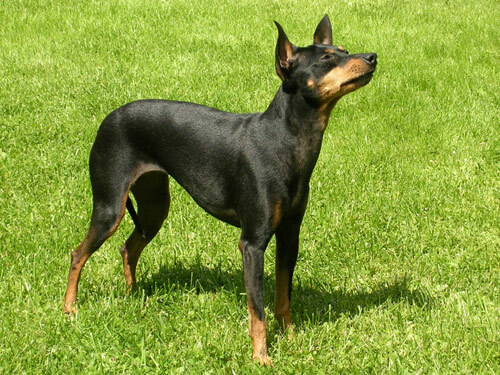 Conditions such as Legg-Perthes, hypothyroidism, deafness, PRA, and patellar luxation are occasionally seen in Toy Manchester Terriers, however, they are not the most common. It is important if you own this breed, to get it tested. Specific recommended tests include eye, hip, and DNA for vWD. If you get your dog tested yearly, then you will be able to track their health to ensure that you see any red flags or indicators to any of the aforementioned conditions. If kept healthy, Toy Manchester Terriers will live anywhere from 14 to 16 years old. Toy Manchester Terriers initially made their way to fame by being the chosen breed to perform in rat killing contests and also dog-racing contests. The people of England cheered these sporting events on and it was considered valued entertainment. The Toy Manchester Terrier is a mix between the Whippet Racer and the Black and Tan Terrier; this mixture was concocted in the 1860s. Many believe that dog breeds were also derived from the Manchester Terrier, such as the Italian Greyhound. Small dogs became very trendy and that is what was in high demand. That is when the Toy Manchester Terrier was created. The only difference, besides size, between the regular Manchester Terrier and the Toy Manchester Terrier is that Toy Manchester Terriers are not allowed to be adorned with cropped ears.